Body Beast, Here I Come! (2) It gives me an accountability/workout partner in Rob! (3) It lets me ankle rest for the next 90 days. (4) I have learned in the past that my body responds very well to heavy lifting, even when I’m doing minimal cardio. (5) It’s something different, that I’ve never tried before. I think that about sums it up. I will be doing the “Lean” version of the program and do not plan on modifying the workouts whatsoever for the next 90 days. I want to see what happens to my body while on the program. I am also happy that my ankle will really have time to rest. It doesn’t really hurt unless I do something silly (wearing too-high heels, twisting it on a curb, etc.) or lots of jumping, twisting workouts (Zumba, plyometrics, jumping jacks). Running isn’t so bad but this will be a good time to completely rest it! What I’m hoping to get out of this program is a lot more strength, muscle tone, and decrease body fat. Last time I checked, I was about 156lbs and around 32% body fat (that is just under 50lbs of fat). I don’t care what my end weight is, just to be more fit! I will retake my measurements this weekend and take pictures. I just forgot last weekend. As for nutrition, I will not be following the plan in the book. 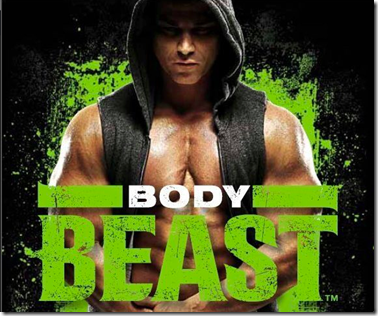 As you might know, Body Beast is geared toward men who want to “Get huge”. Obviously not me. I will continue to eat Paleo. I have not tracked in about a month but decided to the last few days. I thought my calories would be too high but they were actually a little on the low side. I will keep tracking for the next few days and adjust as I see fit. I plan on eating around maintenance level (since I want to lose fat) but will probably stop tracking after a week or so. This is the only thing I am changing about the “program”. I will discuss supplements another day! I’ve only done 2 days so far so I won’t write a review. I like to do weekly reviews but this “cycle” is actually 6 days. Check for a review early next week! 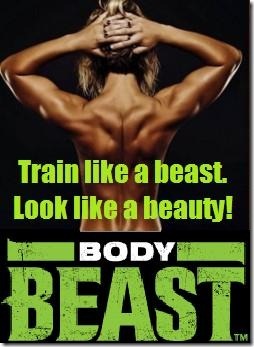 4 comments to Body Beast, Here I Come! I look forward to hearing more about the program. I’m not allowed to lift heavy anymore and it’s THE BEST thing for my body–except my stinking joints/ spine, unfortunately. My metabolism LOVES it. holy moly! Look at those muscles haha. I can’t wait to hear about the program!